Pupils beat the boundaries with sticks. Photo from 2010 by Ianvisits from the Londonist Flickr pool. 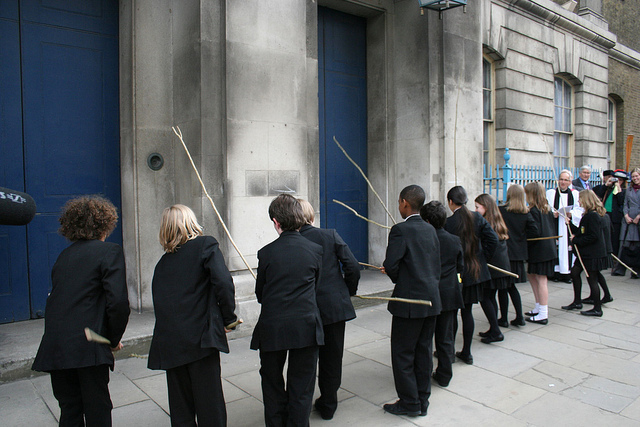 One of the more peculiar traditions in London's well-stocked cupboard of oddities is the ceremony of Beating the Bounds. Dating back to medieval times, every Ascension Day a group of people — a "beating party" — made up of clergy, schoolchildren and (if in the Square Mile) City bigwigs, walk around the edges of the parish, beating boundary markers with long sticks, and praying for protection of the land. The practice was important before maps were common, as it was an annual custom to re-affirm the limits of the parish, passing on the knowledge to each generation. As with many ancient 'frivolities', it was banned by puritanical Oliver Cromwell and revived by the Victorians, who had a penchant for making up new — or resurrecting old — traditions. Such as Christmas. 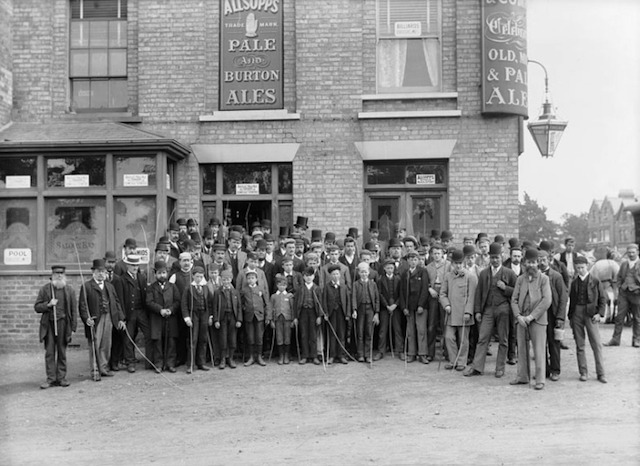 A photo from 1893 taken outside the Ranelagh pub in Bounds Green, showing members of the community at a Beating the Bounds ceremony. Photo from Haringey Pubs by Chris & Hazel Whitehouse. Although many churches mark the occasion, the most eye-catching is that at the parish of All Hallows by the Tower, the City's oldest church. Because the southern border of the parish is halfway across the Thames, the beating party — made up of students from St Dunstan's College, Catford, livery company masters and clergy — takes a boat out into the river, where a student strikes the watery marker from the safety of the vessel. It used to be that they were dangled off the side to perform their duty, but safety concerns have put paid to that. Once back on dry land the group tours the remaining markers before attending a church service. Every three years the church's ceremony includes a 'battle' with the Governor and Yeomen Warders of the Tower of London, marking the time in 1698 when a dispute with the Tower of London over where the boundary lay, erupted into a riot. So if you've seen children wielding sticks today, accompanied by men in odd garb, this is hopefully the explanation.